Such a creative name. I came up with it all by myself. Sad. But this is a VERY yummy dessert and I totally recommend it to anyone who likes blueberry cheesecake. 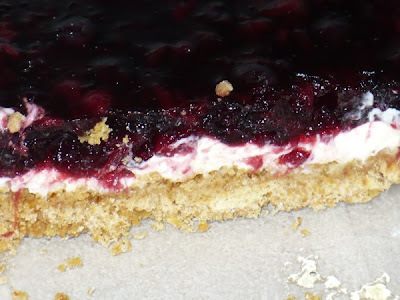 The graham cracker crust is very thick, so if you are not a fan halve the crust recipe. 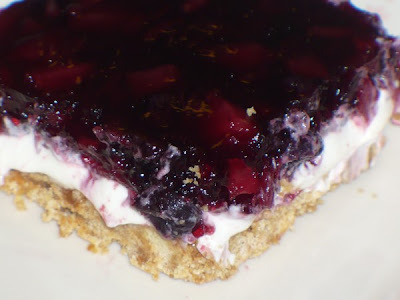 OR you can skip making the crust and use two ready-made graham cracker pie crusts. I do suggest using a full-fat cream cheese to avoid that layer from becoming a runny mess. Preheat oven to 375 degrees. In a medium bowl, combine crumbs, 1/2 cup sugar, and butter. Press into lightly greased 13x9 baking dish. Bake for 7 minutes. Cool completely. In a large bowl, add boiling water to gelatin and stir until completely dissolved. Add pineapple and pie filling and mix thoroughly. Set aside. In a medium bowl, beat cream cheese and sugar. Add sour cream and vanilla and beat until smooth. Spread over cooled graham cracker crust. Gently pour and spread gelatin mixture over cream cheese layer. Refrigerate at least 4 hours. Cut into squares to serve.